A ceramic that becomes more or less conductive under different types of strain could lead to a new generation of sensors able to monitor their own health. Those sensors would be embedded in structures like buildings, bridges, and aircraft. 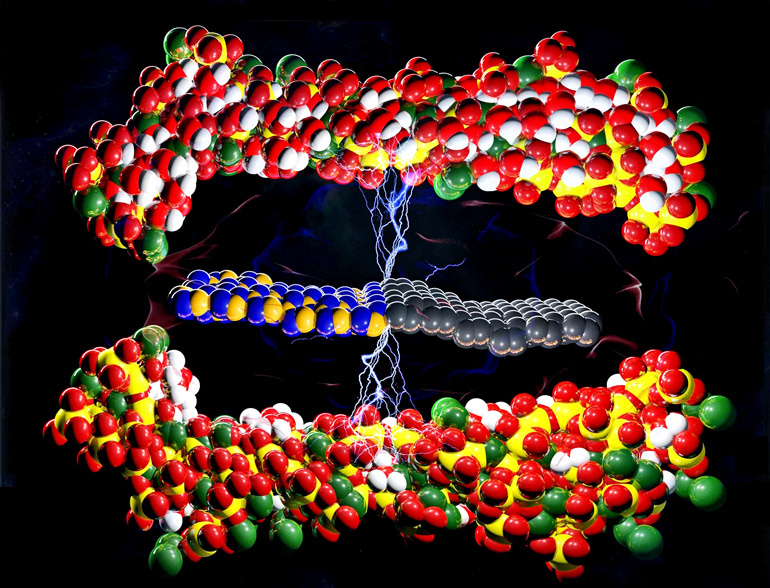 The electrical disparity that the two types of strain—elastic and plastic—foster wasn’t obvious until researchers modeled a novel two-dimensional compound, graphene-boron-nitride (GBN). Under elastic strain, the internal structure of a material stretched like a rubber band does not change. But the same material under plastic strain—which, in this case, stretching it far enough beyond elasticity causes—distorts its crystalline lattice. GBN, it turns out, shows different electrical properties in each case, making it a worthy candidate as a structural sensor. Rouzbeh Shahsavari, an assistant professor of civil and environmental engineering and of materials science and nanoengineering at Rice University, and his colleagues had already determined that hexagonal-boron nitride—aka white graphene—can improve the properties of ceramics. Now, the researchers have discovered that adding graphene makes them even stronger and more versatile, along with their surprising electrical properties. The resulting ceramics, according to the authors’ theoretical models, would become tunable semiconductors with enhanced elasticity, strength, and ductility. Graphene is a well-studied form of carbon known for its lack of a band gap—the region an electron has to leap to make a material conductive. With no band gap, graphene is a metallic conductor. White graphene, with its wide band gap, is an insulator. So the greater the ratio of graphene in the 2D compound, the more conductive the material will be. “Fusing 2D materials like graphene and boron nitride in ceramics and cements enables new compositions and properties we can’t achieve with either graphene or boron nitride by themselves,” Shahsavari says. When strained in the elastic regime, the ceramic’s band gap dropped, making the material more conductive, but when stretched beyond elasticity—that is, in the plastic regime—it became less conductive. That switch, the researchers say, makes it a promising material for self-sensing and structural health monitoring applications. The researchers suggested other 2D sheets with molybdenum disulfide, niobium diselenide, or layered double hydroxides may provide similar opportunities for the bottom-up design of tunable, multifunctional composites. “This would provide a fundamental platform for cement and concrete reinforcement at their smallest possible dimension,” Shahsavari says. The research appears in the journal Applied Materials and Interfaces. Additional coauthors are from the Iran University of Science and Technology and Monash University in Melbourne, Australia. The National Science Foundation and the Australian Research Council supported the research.